Does your child only understand concepts when explained with graphic organizers or charts? Do you often wonder why his or her other classmates get points instantly by listening and they cannot? Does your child feel bad about this? Well they don’t have be. They might just be another kind of learner. In their case, a visual learner. Here are some helpful study tips for visual learners. One thing to do as a visual learner is to pay attention to visual aids that come with the information that they are supposed to learn. Modern classrooms often incorporate charts and graphic organizers for learning. Even textbooks nowadays have colored illustrations of concepts discussed in a couple of pages. To further maximize the function of these graphics, tweak them to further suit your child’s style. You can understand and retain information better if they can organize ideas using these. For example, your child can use concept maps to understand and remember the relationship of things. You can also create charts to organize data in a manner that makes more sense to your child. Another great strategy for a visual learner is to supplement your classroom learning with Visual Brand Learning study guides. It’s also advisable that visual learners incorporate colors in learning. for instance, in your child’s language class, you can use multi colored pens to categorize information, like using blue ink for writing subjects and red for predicates when learning parts of a sentence. You can likewise use highlighters to mark important ideas in your child’s books or notes. The key to effective visual learning is to maximize the use of materials that tell more by showing than by explaining. Understand these principles and you will be surprised how much you can learn by seeing. 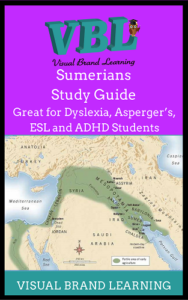 Our Sumerians Study Guide is on sale for a limited time on Amazon.